What is your interest ? 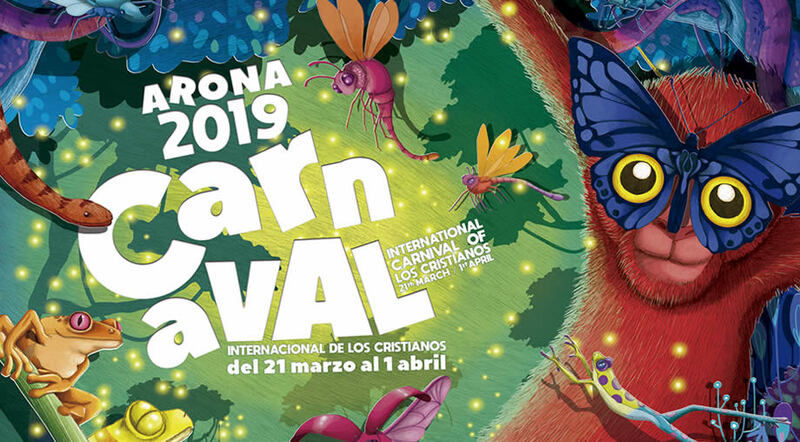 Los Cristianos is the host of one of the largest carnivals in Tenerife South and in 2018 over 35.000 people have participated in the main parade (El Coso Apoteosico del Carnaval de Los Cristianos). Although the most popular carnival on the island is the one in Santa Cruz, many other towns and resorts celebrate their own carnivals, since Tenerife is a year round tourist destination and any reason to have a party is happily accepted by everyone. The carnival in Los Cristianos is probably the most popular event of its type in the South and it's fun to participate in. It doesn't matter if you get dressed up or not, the carnival has a unique energy that spreads among all of its participants, so be sure to join in if you are in Tenerife at this time of the year. The theme in 2019 is The Jungle and you can dress up accordingly. Colorful outfits are always on trend during carnivals and you can find plenty of decorations and costumes in the cheap Chinese shops or at the local market. 8:30 p.m. Presentation of candidates for Children's Queen, Queen of the Golden Age and Queen of the Carnival. 7:00 p.m. Announcing Carnival Parade . PLACE: Playa de Las Américas, from Shopping Center Gala, Avda. Rafael Puig Lluvina, until Shopping Center. Oasis, Avda. The Americas. 7:00 pm Dance of the Golden Age of Carnival. PLACE: Patio of the Cultural Center of Los Cristianos. 9:00 p.m. Gala Drag Queen of the Carnival. PLACE: Carnival área (in front of the Valdés Center building), Los Cristianos. At the end: Great dance entertained by the orchestra Wamampy. PLACE: Carnival área (in front of the Valdés Center building), Los Cristianos. 12:00 Family stage with variuos performances and Carnival workshops. PLACE: La Pescadora, square Los Cristianos. Warmest Canary Island During Winter - Where should you go on holiday? Tenerife Weather in April - What Should You Expect? Fuerteventura Weather in April - What Are The Temperatures? Hottest Canary Island in Summer - Where to go for a beach holiday?